Here's the TMI- I am trapped in my house today because my beloved puppy has explosive upset tummy. We can't leave him, lest he need to go out and handle his business. So, like any good fashion blogger wannabe I decided this was the perfect opportunity to test out some potential outfits for my homegirl Tartan & Sequins much anticipated Easter brunch. I'm not sure this will be the winner (I am at the whim of my hair and what it decides to do any given morning) but the clothes were here, so why not. Outfit option number one is this floral dress from Maurie & Eve , which might literally be the most flattering object of clothing I own. 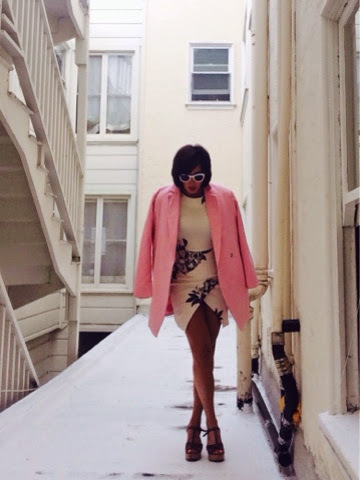 Obviously Easter equals PINK COAT, because it does. Please note it matches my nails. Throw on my trusty Steve Madden circa 2005 cork and leather wedges and voila! What do you think? Should I wear this one?